Managers owe it to the organization to help their employees grow professionally. It’s hard, time-consuming work. But the return on investment is terrific. The organization benefits from higher employee performance and lower turnover. Strong employee retention obviously saves the employer a lot of time and money. Savvy employers also benefit because motivated employees are a source for profitable ideas. Managers win in other ways. By helping employees, supervisors enjoy great personal gratification for doing the right thing. Plus, with a fully developed staff, managers are more-easily propelled upward. The better trained staff gets promoted and accompanies on the managers’ coattails. The ideal situation is to employ people who are motivated in self-development. However, it’s also true that not all employees want to develop to their full potential. It’s best to try to help them, but not force the issue. Ideally, such hesitant employees will envy the success of employees who participate in your development program and they’ll reconsider participating, too. Again, for success, employees must voluntarily commit to the development process. Employees have to do the work — some on the individuals’ time and some on the employers’ time during work hours. The manager’s role is that of a coach. As a coach, the manager must take the time to deliver on all commitments. Remember the employee will be attending training courses or workshops. Such absences are often inconvenient for the employee, manager and department. The work piles up but the work needs to get done. Employees need to be encouraged to keep going. The manager must be patient and proactive to solve the workload gaps, and to provide opportunities for the employee to use the new skills. To reiterate, manager commitments are important. Failing to adhere to commitments to the program means the manager will undermine the objectives. Worse, the employer will create and exacerbate morale issues. In essence, for short-term and long-term growth, the following simple illustration shows how to plan the process. A supervisor who successfully empowers employees is more than a caretaking manager. Such a person shows leadership. Furthermore, employee development is a vehicle for stronger organization performance, and completion of a self-improvement program will also prepare the employee for career opportunities. Employees will be appreciative and for managers that’s a source of pride. HR Management – 8 Best Practices in Employee Delegation — Delegation is a fundamental driver of organizational growth. Managers who are effective in delegation show leadership. They know they’ll be more effective in management and that they’ll develop their employees. Profit Drivers – How and Why to Partner with Your Employees — If you want maximum profit, consider partnering with your employees. 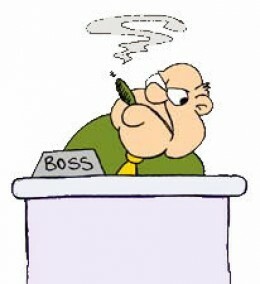 If you’re like many professionals, the concept of managing the boss might seem strange. It’s really about maximum communication and earning a deserved reputation of being a strong performer. To enhance your career development, you need to learn how to connect with your boss. Actually, successful management of the boss is beneficial in multiple ways. In a direct sense, you’ll get in a position to perform better. Indirectly, it will foster better teamwork and it will become more plausible for the company to maximize its performance. Oh, and you’ll improve your working conditions, job satisfaction, and responsibilities. So become a bigger asset to your boss, and you’ll be very happy. 1. Learn the goals of your boss. Discover how your supervisor’s objectives mesh with the company’s mission. To get more insights and to facilitate good communication, find out what your boss reads. 2. Assuming your boss has a boss, get acquainted with that person’s concerns, as well. In this way, you’ll better understand your immediate supervisor, what makes that person tick, what the person’s pressures are, and what the solutions are. 3. Communicate with your boss about daily issues confronting the company, as well as the good news. 4. Timing is important. Know when to approach the boss. When you enter your manager’s office, remain standing until you’re invited to sit down. Discern what actually is warrants your supervisor’s energy and time. Solve the simple issues. 5. Strive to become the go-to person for your manager. Look for opportunities to give your boss a hand without seeming to be patronizing. 6. Save your boss time. Be aware of the policies, but don’t expect your boss to hand you specific guidance unless it’s necessary. In other words, don’t bog your boss down into minutiae. 8. Understand your manager’s expectations and priorities. If you don’t know, ask. 9. From time to time, you’ll have to bring problems to your boss. Be prepared with possible solutions, too. 10. Be a good project manager and keep all commitments on deadlines. Keep your boss informed. Bosses don’t appreciate negative surprises. 11. Continually work to build trust. If you’re convinced your manager won’t object, independently solve problems and inform your boss later about your successes. 12. Be a good listener. Take notes. 13. The day before an important meeting, rehearse how you’ll present the information. Reflect on the questions you might want to ask. Effective participation is key. 14. Be a good communicator with your peers. Use a collaborative approach on problems. Conclusion: In essence, learn the definition of a good employee. Know your job and responsibilities. Perform with independence without having to be overly managed, but understand your limits of authority. Know what the boss expects; but when you’re unsure, ask. Work well with your team members. Communicate well and look for solutions to problems. Good luck. I look forward to seeing you some day in the C-suite.